A few weeks ago, I discussed the experience of teaching the comparative history of Native America this past spring. With syllabus-writing season well underway, I thought it would be useful to pick up on one thread I left dangling in that post on how I designed the assignments. In some ways, this was the most challenging part of the course (which was at the 300 level). At my university, those courses are intended not only to introduce students to a specialized topic in the field, but also to ask them to participate in the craft of the historian either through historiographic or research engagement. This posed a challenge for me. Teaching at a public university, we don’t have quite the same resources as others might: for example, there’s no Native American history museum on campus and we don’t have a research library with an extensive collection (nor was there the budget to ramp up the Native American collection in short order for the course). So the task for me was to find ways to introduce students to the field without being able to assign them a “clean” research paper, that is, I couldn’t simply say, “pick a topic and go.” Instead, I decided to break down the practice into some of its constitutive parts. Most importantly, I wanted students to get some research experience with sources that Native American historians use frequently: material objects. 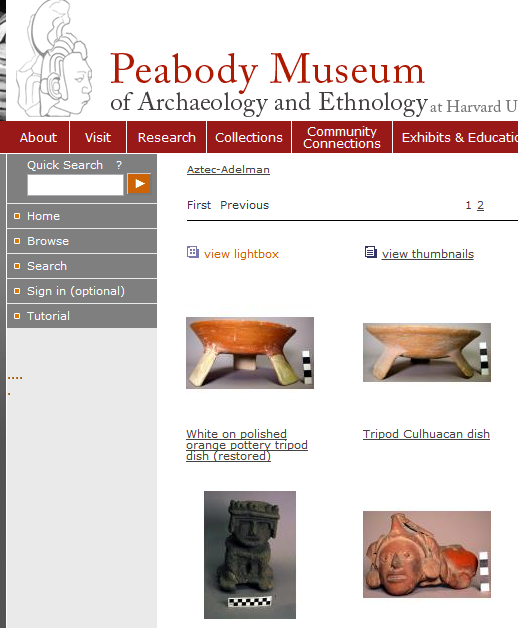 Because we couldn’t get access to physical objects (and a field trip was not feasible), I worked with the curatorial staff at the Peabody Museum at Harvard to put together an online exhibit for the class. The students broke into three groups to select items from North America, Mesoamerica, and South America. We met (via Skype) with a curator who introduced us to the Peabody, its collections, policies, and so on, and then students chose a single object as their focus. During the semester, students then completed two assignments related to the object of their choice. First, each student wrote a “biography” of the object, using the guide to examining material objects written by Daniel Waugh as part of the World History Sources site developed by the Center for History and New Media at George Mason. The questions Waugh suggests invite students to ask contextual questions they should pose for any source—What is it? Who made it? How was it used?—and offers examples on how to answer those questions. Waugh also poses a key question for material sources: where is it now and how did it get there? For our purposes, we had an answer to the first part, and the Peabody staff walked us through how to unravel a piece’s origins (which, for much of its Mesoamerican and South American collections, involved some pretty unsavory nineteenth-century practices). Each student then wrote a brief post for the course blog on his or her object. For the second part of the assignment, students extended their study by proposing a research paper using the object as a central source. In other words, if we can’t do an entire research paper, at least we can think about what kinds of questions we would ask. Reading up on the topic in question, students offered a set of questions that seemed unanswered and promising, and again wrote up the results as part of a blog post. They did so there largely to make sure that students could get a sense of the whole. Each person had one object from one region, but by posting on a course blog rather than handing in papers, students could share their experiences and teach one another about the periods and peoples they had studied. King Philip’s Sash, Peabody Museum of Archaeology and Ethnology. The assignment was, if I may say, a success. Students examined objects as famous as “King Philip’s Sash” and as indescribable as an Inca stone mace. One student even suggested a re-classification of a collection of gorgets as brooches. And students were able to “bring” their objects into class discussion when we were discussing a topic where they were relevant. For the second major writing assignment, we started by reading Victors and Vanquished, a collection of documents related to the Spanish Conquest of the Aztecs in 1519-1521 from both Spanish and Native sources (edited by Stuart Schwartz). As part of the Bedford Series in History and Culture, it’s a compact and eminently useful way to introduce students to the topic and the sources. We spent nearly an entire week of class meetings talking about the Conquest in detail. Students read the introduction and a chapter of another book (Memories of Conquest by Laura Matthew) to get background. In class, we worked step-wise to understand the Conquest, starting by putting together a “cast of characters” and chronology. Then we worked on just a few documents, using the Spanish and Nahua accounts of the first meeting between Moctezuma and Cortes to discuss how to assess each source (what can we believe? about what should we be skeptical?) and how to use the two accounts, which differ on key points, to write a single story. Third, groups of students worked with entire chapters of the reader, working to analyze the strengths and weaknesses of a group of 6-8 sources on a small portion of the conquest. Then, inspired by an assignment in one of my own college courses on the fall of Constantinople, I asked students to do something that made many of them very uncomfortable: write a narrative history. To be completely honest, I had no idea how much oxygen this project would take up in the course. I had initially planned to allow students to do two drafts of the paper, knowing that few would have written anything narrative. But we ended up devoting quite a bit of class time to talking about how to structure a narrative, how to integrate sources that disagree into a single story, and how to embed a narrative. I also ended up adding student conferences about the first drafts so that each student would have the chance to talk through their questions. I’m also pretty sure that my students thought I was torturing them. Actually, I’m certain of it, because they told me so several times. It was hard for them, and it was hard for me (having trained to write primarily for academic purposes). As I mentioned in my earlier post, the course lent itself a bit too much towards diffuseness, and in certain respects the structure of the assignments encouraged that in a way that a single focused research paper would not have. But I think students enjoyed them—okay, they enjoyed the material object project, and most at least appreciated the narrative history in retrospect. And I know I would use these assignments again. If and when I do, I would likely budget much more time to discuss writing, which was the part of the narrative history assignment that students struggled with most. And I might add a bit more rigor to the material object assignment; I focused on the object itself a great deal, and so would want to work with students to contextualize more broadly next time. Have you used any assignments outside the ordinary for your courses (in particular Native American history)? Please share your ideas in the comments. Very cool, Joe. Thanks for sharing here. I especially like the material object assignment—I’m not surprised that the students enjoyed it, and that’s great that the Peabody Museum was so helpful. Joe, great post, and I’d love to talk more sometime about the material culture assignment. I have tried a different approach for the research paper I set – I ask students to find a modern-day Native American news story, and task them with writing a paper that places that story in its historical context. There are a few ideas behind this: 1) to get students to think about what really interests them about the subject. 2) to create awareness that Native Americans still live in present-day society and that many of the issues we talk about have resonance (or, in other words, to get students to think more carefully about agency). 3) to give some sort of potted experience of writing history backwards as well as forwards. I may have to dedicate a blog post of my own to this. Ken, we should absolutely have a chat about the material culture assignment. I like the idea you have for using a modern-day equivalent as the basis for a research paper. We did something like that on the last day of class, where the class looked at pop culture references to Native Americans (I showed them the “cigar store Indian” clip from Seinfeld), and then students found a great video compilation of references in children’s movies. We also talked about casinos, sports teams (oh how I wish Slate had made its decision a few months earlier!). They got really into it, and it worked nicely to tie the course together. So yes, you definitely need to write a blog post about this, because I at least want to hear more about how you structure the assignment, how much latitude you give them in terms of topics, how much you make it about memory, and so on. Write away! I found this post quite helpful for material culture pedagogy on “Tokens of Friendship” and related studies by historians such as Tyler Boulware and David Silverman, as well as the recent anthology call for papers on Friendship in Early America. Thank you.